School started up again this week for the kids, and amazingly, did so without too much drama. The night before Day One, we talked to the kids about the new routine over dinner and everyone got to contribute to the planning & final decisions. I have to say (with a huge sigh of relief!) that this schedule looks like it’s going to work for us. Hooray! Each kid has to be at school at a different time so we stagger wake-ups. As each one gets up they go straight to the shower, brush teeth, get dressed. Next up is breakfast for them & lunch-box filling for Mom, then off to the bus-stop. Rinse & repeat three times with the exception of Tor getting driven to Pre-K after lunch. Snacks & chats, followed by homework. After homework their time is their own & they can have 1/2 an hour of screen time of their choice between 5PM and 6PM (while dinner is cooking). Dinner is served up shortly after 6pm (Tomas and I are taking turns with this), and everybody is expected to help clear up. Bedtime prep starts at 8pm and includes teeth brushing, and laying out of clothes for the next day. 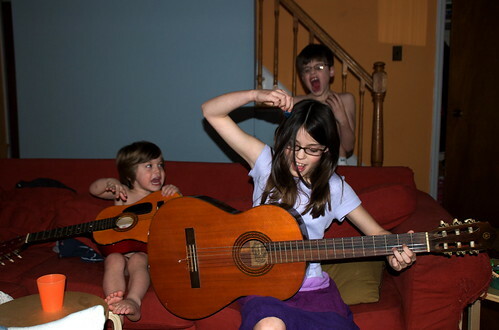 We settle down with books, guitars, piano, conversation and iTunes — sometimes, not always such a quiet event (as pictured above). Lights out is at 9pm. So far this week, all three of the kids have been in bed and asleep by 9pm as scheduled. Hooray! PS: in case you are wondering about the picture… I believe the song was original lyrics about stinky farts, sung to the tune of Gloria Gaynor’s I Will Survive.